JM Decor perform for your concrete countertops for kitchens, bathrooms (with integrated sinks), seats, tables, furniture, style # loftmodern. We offer installation at the customer or delivery of finished components. Waxed concrete will cover landscaping elements, the end result provided by the project, or made samples. We offer the trips of any kind of concrete Ciré on the surfaces of walls, floors, stairs. We also perform trays, fountains, pools mikrocementem polymer. Professional installation of plaster thin, metallic inks, experience and quality of work at the highest level. We work with architects, interior designers. 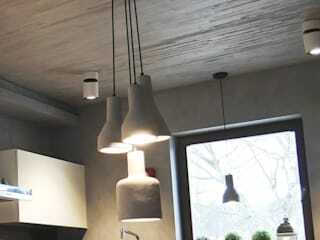 Beton Ciré is "indestructible", not afraid of water, can be multicolor, easy and fun to care. Being a mixture of cement and polymer has the properties of conventional cement. It is resistant to extreme loads, while preserving flexibility. It can be introduced into any room, both in the kitchen and salons.